As we’re at the height of basil season here, I thought I’d share with you my method for how to keep basil fresh after it has been cut from the plant. 1. Wrap the stems in a damp paper towel. 2. 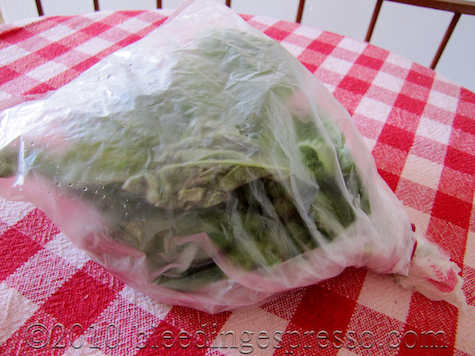 Put a plastic bag over the unwashed leaves and secure with a rubber band at the base. 3. Place the basil in the refrigerator. 4. Pluck off leaves as you need them, washing just before use. With this method, I have kept basil fresh for up to two weeks in the refrigerator, but you do want to keep an eye on it if you’re not using it immediately. Be sure to re-wet the paper towel when it’s going dry and also remove any leaves that are turning black and/or slimy; they will get moldy if left in there too long. If you still aren’t using your basil quickly enough before it goes off, wash and pat dry the basil then tear off the leaves and pop them in a freezer bag. The leaves won’t be great for something like a Caprese Salad once they’re thawed, but they’ll still add great basil taste to soups and dishes like our Borlotti Beans alla Calabrese — and they do retain excellent flavor for about four to six months. What are your favorite food storage tips? Okay this one I’m going to share – always had problems. Our frutivengalo always gives us big bunches and much of it goes to waste. No longer! Mille grazie. Personally, on the basil plants I have, I never pick a whole long stem (since I only have five), I just pinch off the largest leaves (and the ones near the top blocking out the sun) as needed. Just 10 leaves or so for a caprese, but then sometimes I let the plants go and then get 2 or 3 cups of leaves to make pesto. That way, I don’t usually have them around for more than 24 hours. But this is good to know for market basil, which usually does come like this. Thanks! Yes, on our own plants I don’t usually take off more than I can use in one meal, but when someone gives you a bunch, this is the way to go 🙂 Thanks for coming by, Daniel! Hi Michelle, thanks for this great tip for storing in the fridge! If I’ve some basil to use from my plant or bought too much fresh basil, I do the same, you do: wash the leaves, dry them as I do with salad and then store them in the freezer! Great tip Michelle. Thanks for sharing it as I’m frequently having to throw Basil away. Thanks for the great tip! I love basil, and we now have a plant of it. But before, when I would pick up bunches (yummy organic pruple bunches from our farmers market) I would panic because it would go all wilty very quickly. I used to try and keep it in a little bit of water, like flowers, but that only works so long. Hope this works as well for you as it has for me, Kalee! Perfect timing since our basil has done amazingly well this year and we have more than we can use. I would love to have it in the winter so I will try your method. A few weeks ago I tried another method I found on the internet (coarsely chop basil leaves and add olive oil, then store in freezer) but since I have so much fresh basil right now, I have not tried any of the frozen yet. Grazie – mi piace tantissimo il tuo blog! I haven’t heard this method before. thanks for the tip. Great tip! Just learned this trick recently myself, and it works just as well for parsley and other greens too. I take a bunch of basil or cilantro and prop them up in a drinking glass (and I do mean glass- the whole thing needs the weight of the glass and water to keep from tipping over in the fridge) filled with water up to the leaves-but hopefully not touching the leaves. If there’s ‘room’ to cut off an 1/8 inch of stem I do that, too. Then I cover the whole thing with a plastic bag…….they seem to do quite well for a really long time. My favorite ‘recipe’ for freezing basil is to put it in the processor with enough oil to chop well and a load of lemon juice. The lemon juice keeps it from turning dark green. In fact, it stays quite spring green even after frozen. A bit of lemon in a recipe doesn’t seem to ruin it. I hope this works for all of you. Thanks for your tips, Francine! Like others, I put into jars/jugs. But I also do the old basil puree-into-ice-cube trays. So worth it in late autumn/early winter for a nice spoonful into soups, sauces, etc. Also extra fruit (on sale or you have too much to eat & are in a hurry) blueberries, blackberries, cherries (pit them first) & then freeze in one layer on a cookie sheet or a pie plate. Whatever is around. Put into freezer bags. You’ll be glad you did. I had several pounds of organic cherries last year & not enough people to eat them. I did this & was very happy. Don’t do with strawberries, they get gross. Make quick fridge jam w/those & raspberries. See Nigella Lawson quick oven jam. You have an award from me. I posted it yesterday on my blog! That’s a handy tip! Thanks! I never have much success sort of ” preserving” basil for later. I have done the parsley/cilantro in a glass and plastic bag in the frig thing. I have thought of pureeing and freezing basil in ice cube trays. I’ll try the one with lemon juice next. I also freeze blueberries, raspberries and blackberries on cookie sheets overnight and then put them in 1 cup freezer bags. That works really well so we can have “fresh” berries all winter. This year we have lots of carrots so are going to try the box of sand method. We do have a very old falling in root cellar that we should repair for the eventual necessity of using it for food storage! I love the idea of free food storage using NO electricity or fossil fuels, only good old Mother Earth. My home grown basil has been really successful this year (finally!) so I’ll definitely try this. Thanks. Hope it helps make it last, Cathy! Thanks for the tip! My favorite way to preserve basil is to make it into pesto and freeze it. Pesto is one of my favorites too! Haha that’s cute 🙂 Thanks for sharing!